"Any man can be a father, but it takes a special person to be a dad"
Richard Quan plays the role of a widower and a father to 5 girls whose age ranges from 17 to a newly born baby in NET 25 first ever teleserye entitled "5 Girls and a Dad". It will be shown weeknights starting on January 23, 2012. Monday to Friday 7:30 PM-8:30PM. Written by one of the country's multi-awarded writer Ms. Lualhati Bautista and directed by Elson S. Montalbo. Eagle Broadcasting Corporation is the owner of Net 25. 5 Girls and a Dad - is NET 25 first ever teleserye. This is the first major drama series of NET 25’s Entertainment TV Division which aims to deliver more quality programs for EBC and the viewing public this year. “5 Girls And A Dad” is EBC-NET 25’s first ever teleserye, which promises to captivate the audience with its storyline which focus on Filipino family values. This new drama series is timely as it mirrors a phenomenon in Filipino society – the growing percentage of single parent families. Beauty-queen-turned-actress, Lara Quigaman plays the role of Veron, Enzo’s wife. The couple has five daughters, played by NET 25’S new talents - Dixi Nedic as Mimay, their eldest, Kate Nizedel as Anna Lisa, Abby Quilnat as Alex, and child star Chesca “Cruzita” Salcedo who plays Valerie, the child with autism. In the story, Veron dies while giving birth to their fifth child, Angel. With Veron gone, Enzo, a taxi operator/driver, is devastated and is left to take care of their five daughters. There will be a simulcast screenings in five separate areas of Metro Manila from January 23 to 28. Screenings will be in different public area per day where the target public can watch the teledrama as it is aired on NET 25. There will also be a special screening at San Andres Sports Complex in Manila on Saturday, January 28, 2012. There will be an advance screening of the 5 Girls and a Dad -NET 25 first ever teleserye's first episode in Digital Cinemas in Metro Manila on Saturday, January 21, 2012 at 10 a.m. The venues are: SM North EDSA, SM Mall of Asia Cinema, Robinson’s Galleria Cinema, and Robinson’s Place Cinema. Free admission to the viewing public. parang magnadang panoorin .family oriented at may makukuhang aral. Net 25 is a local channel in the Philippines. It is the TV station of Eagle Broadcasting Corporation. 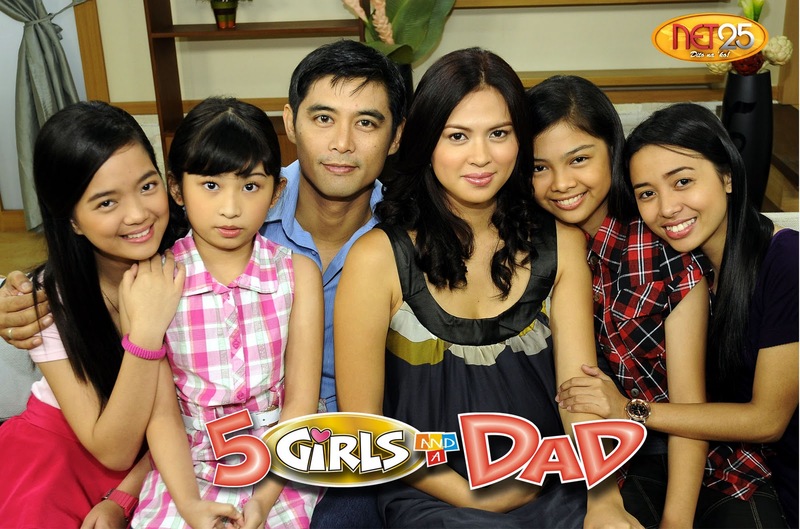 Watch out for 5 girls and a dad on January 23 7:30 to 8:30 p.m.
Opo Miss Tess! Panoorin mo po! usually walang programming na ganito sa net25 e. good job. first teleserye from net 25...hmmm...interesting. Sana it's good. I'm curious. I'm glad to see how other networks (aside from the giants) are branching out and trying their hand at producing their own content! :) The plot sounds interesting. Aside from the live screenings, what time and when is it going to air on Net25?